operation daily work with the Autostainer XL is especially easy and efficient. The Leica Autostainer XL’s precisionmade, trouble-free, stainless steel robot arm moves swiftly and quietly on the x, y and z direction motion axes to process the slide racks. The microprocessor controlled Leica Autostainer ST5010 Slide Stainer has 15 programs and is designed to be simple to use and operate. 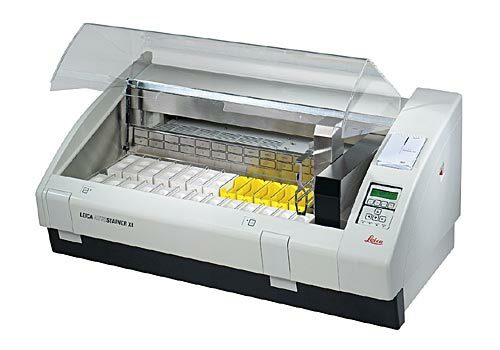 The Leica Autostainer ST5010 Slide Stainer has an innovative continuous load and unload drawer access and robot arm system that lets you continue slide processing without stopping the instrument’s operation. • Easy-to-clean and resistant surfaces made out of polyester epoxy resin and stainless steel. Incubation time setting: from 0 sec. up to 99 min, 59 sec. The proven Leica Autostainer ST5010 slide stainer continues to provide reproducible, consistent, high-quality staining and increased workload throughput. The flexibility of open consumables and reagents along with the option to use validated Surgipath reagents, consumables and protocols provides superior staining and coverslipping quality. The ST5010 slide stainer can be used stand-alone or integrated with the Leica CV5030 glass coverslipper. Eliminating the manual handling of slide racks between staining and coverslipping creates a ‘walk-away’ staining/coverslipping workstation. Upgrade at any time to match your laboratory’s specific needs.